Does the look of your kitchen scream “worn and outdated” rather than “sleek and modern?” You certainly aren’t alone if this is the case. Many people either buy houses that aren’t necessarily equipped with the cooking space they wish for, or are living in homes with a kitchen in serious need of updating. If this sounds all too familiar, perhaps the anticipated cost or the fear of living in a construction site are holding you back. Hiring the right professional can keep custom kitchen remodeling from becoming too overwhelming. Here are three reasons why you should opt for an updated space. For most, the kitchen is one of the most-used rooms in the home. If you’re going to spend an extended amount of time there, you may as well love and appreciate it. Working with a remodeling specialist to transform this important room ensures that you end up with exactly what you want. You could choose to leave your outdated kitchen as-is or opt for cookie-cutter designs and features; however, going custom truly makes your house feel like a home that directly reflects your style. Adding off-the-shelf features or upgrades to your room can certainly transform it for the better if it was in major need of an overhaul, but choosing custom kitchen remodeling with the help of a professional ensures you reach maximum functionality. A design custom-suited for your space allows for planning a kitchen that will meet your needs and make easier work of cooking. Undergoing a kitchen overhaul opens up the opportunity for immensely reducing your energy costs. Depending on the scope of your wants and needs, this could be your chance to opt for more energy-efficient appliances and features. While updating your room will be an expense, your choices may save you money in the long run. 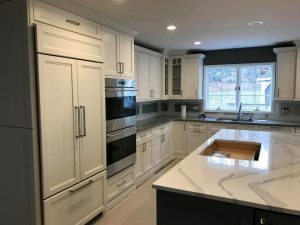 Besides metamorphosing your kitchen into a sight that’s beautiful to see, working with a specialist in custom kitchen remodeling provides several other benefits.